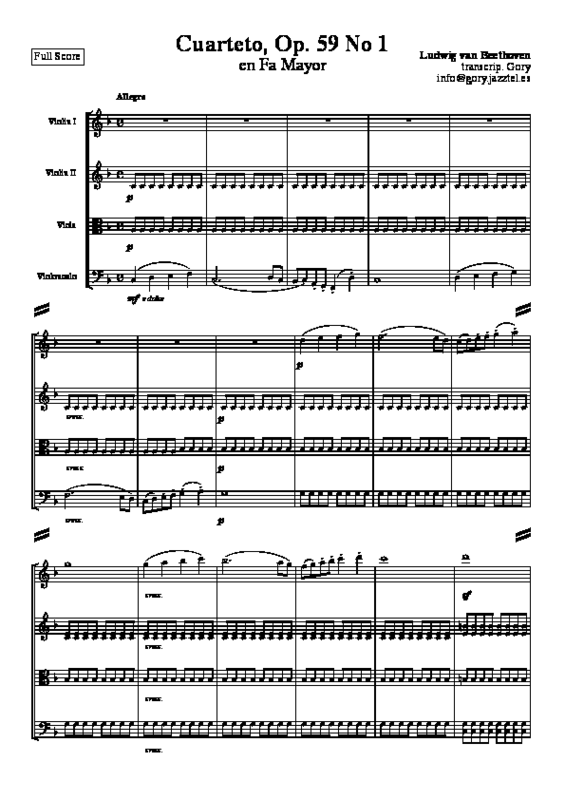 Lately, I've taken up an interest in synchronizing video scores to my favorite recording of a piece, as I have done with Tchaikovsky's Symphony No. 5 in E Minor. One of the most important parts of creating the videos is getting good images of the score. Luckily, the Petrucci Music Library (IMSLP) has a vast collection of scores for music that has entered the public domain, but they're not always in the best format for videos -- generally too small. 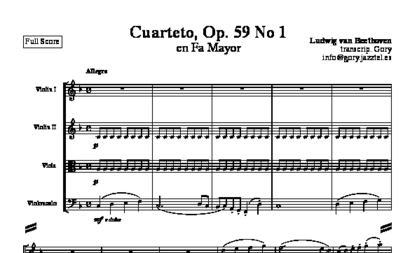 Sometimes, there's not a lot one can do, especially when the PDF is a scan of a physical score, but when it is typeset in a computer program and exported, the "perfection" of the score can be exploited to do some interesting things. 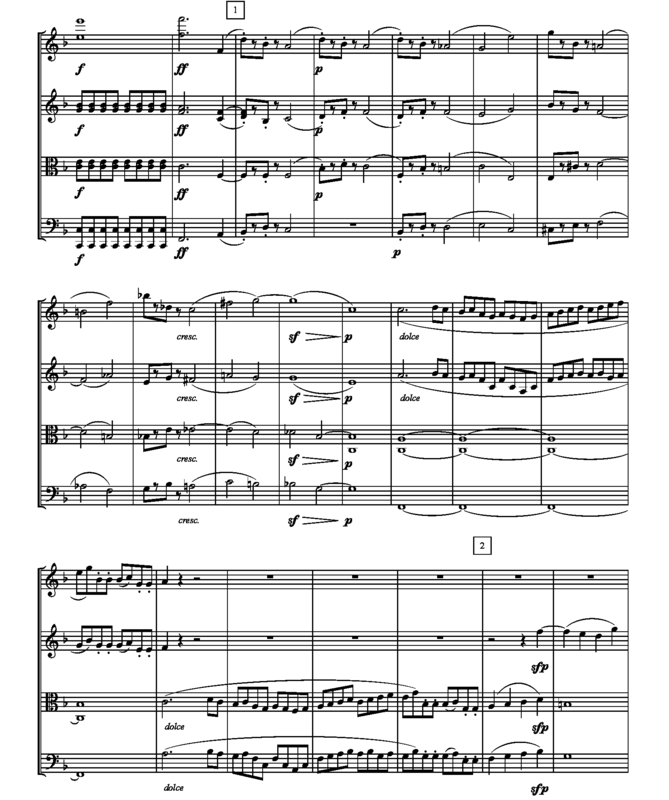 In this post, I mess with the score of Beethoven's String Quartet No. 7 to make it more video-friendly. I downloaded the score for Op. 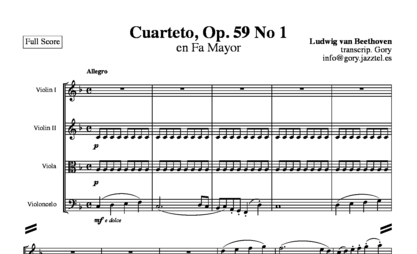 59 No.1 (one of the "Razumovsky" quartets) from IMSLP's page. 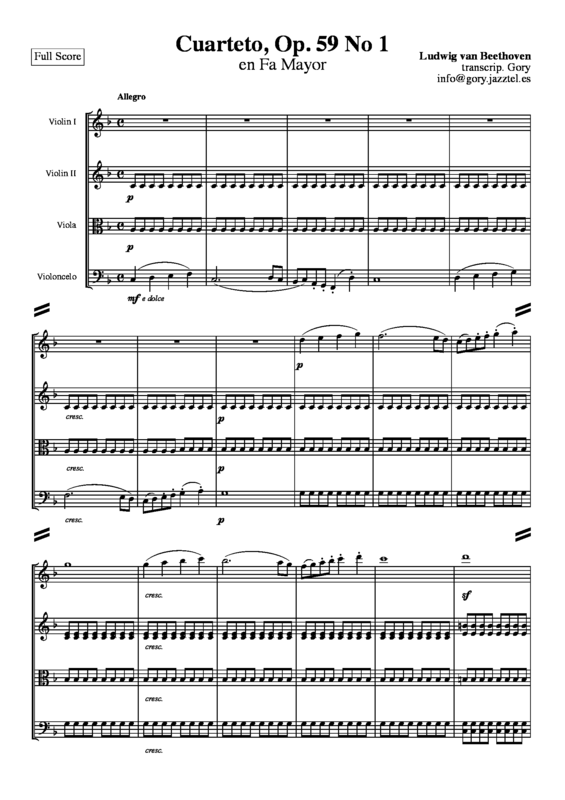 I chose the score typeset by Gory (username Jgjgjg) in Finale, and the score is under a CC-BY 3.0 license. From now on, I use ImageMagick to extract and transform the images -- and it really is magic(k). 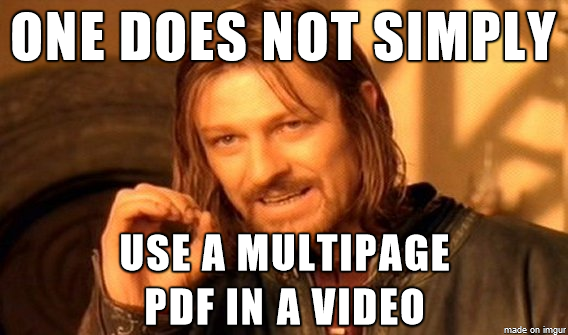 What we download is a 76 page PDF with the music for all movements, but you can't just put a multiplage PDF directly into a video. Well, not easily. Fortunately, ImageMagick has just the tool do to this. Enter, convert: one of the most useful programs known to man. This work of sorcery has the power to convert PDFs into images, crop images, and splice images, among its many arcane capabilities. As you may guess, that's precisely what we need to do. Using -flatten, as another answer suggested, caused all of the page in the PDF to stack on top of one another -- and that's definitely not what we want here. This resulted in images with dimensions of 1653 x 2339 pixels, and this is definitely enough for the score to be both sharp and legible. Note that going beyond a density of 200 will require significantly more disk space. While trying 300, it went through the 20GiB of disk space I had available with tons of files in /tmp/ before a core dump, so one will definitely need more space to make it work. Do you see all the white space? That's a total of more than 500 pixels! It's wasting precious real estate in a video, so next I will go into cleaning up the pages. When looking through the documentation for ImageMagick, I couldn't find any "easy" way of deleting a section from an image. Then I remembered seeing the docs for cropping, and I realized that my goal was fairly simple. I just had to cut the original image up into regions with little whitespace, and then merge them back together. Note: Since the very first page of the PDF is a title page, I will be referring to the first page with music. 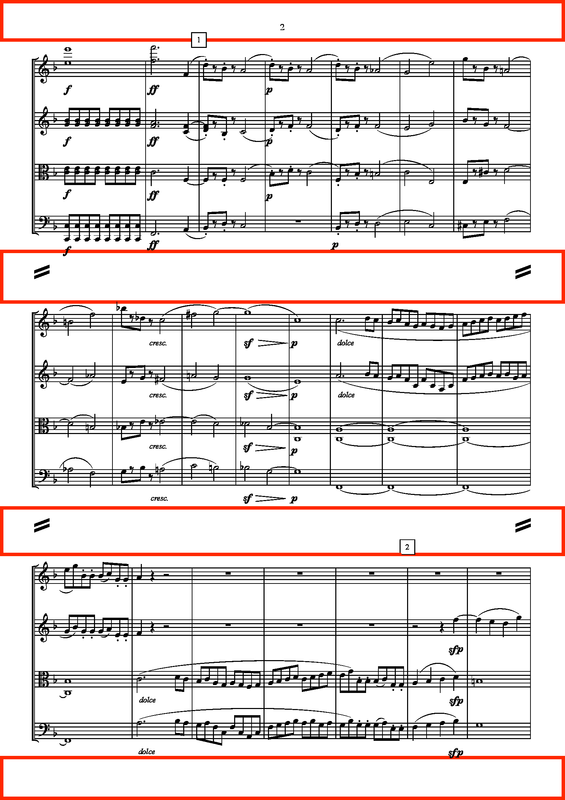 All pages (including the first page with music) have three lines each, and each of the three lines on all following pages starts in the exact same place. We can use this convenience to "cut out" lines for each page automatically. The coordinates start from the top-left of the image. The next step is to find the rectangles for each line; we will do the first page at the end because it is irregular. The widths for all rectangles will be the same, the entirety of the image, since we are only cutting out space vertically (even if we cut out space on the left and right, that won't help in reducing the pillarbox). The goal is to make the fit as tight as possible, while making sure all of the notes (and preferably dynamics, too) are within the bounds. Just modify start and end, and re-run the script to see the output of all images. My final numbers for start and end were 92 and 754, respectively. The only change here is that I added two variables, basein and baseout, which allowed me to save the crops into a different folder (in this case, "cropped"). The numbers you see commented out are from before I cropped out the page number and some extra space at the bottom. This is where we start to have fun with the images. Right now the approximate aspect ratio for the combined, no-whitespace image is 5:6, whereas YouTube suggests using a video with a 16:9 aspect ratio -- especially if we want the score to be easily readable. We don't even come close, and our result isn't really much better than what we had originally (something close to 7:10). To fix this, we just reduce the content on a single page. Yes, only put two lines on a page instead of three. Normally, this would be a nightmare to do if avoiding significant manual labor, but the lines being in the same place make this possible. We already cut out the lines on each page, so all that is remaining is to modify the splicer to pair lines together for each page. The only problem is to replace the use of the wildcard in the convert command, and we must add some mechanism earlier in the script to keep track of the current file. I solved this by finding and sorting all line images, and then iterating through the list in pairs. This approach is also robust enough to be modified to put any number of lines on a single page. The downside to changing the number of lines on each page from three is that the pages are not the same size, but this can be fixed (albeit not easily) by adjusting the crops for the lines to produce images of the exact same size. When I used it in my video, these differences were negligible and had little effect on me, as a viewer. Also, the first line, along with the title of the piece, is always on a separate page, and I did this because it is essentially the equivalent of two lines. If it were used for more than three lines, it would probably be best for the script to treat it as such. After making all the efforts of putting the commands in scripts, all I had to do to crop and reassemble the pages was to run transforms.sh and combine-pages.sh, and I was done. I finally synchronized the score to a performance, and the video is below.